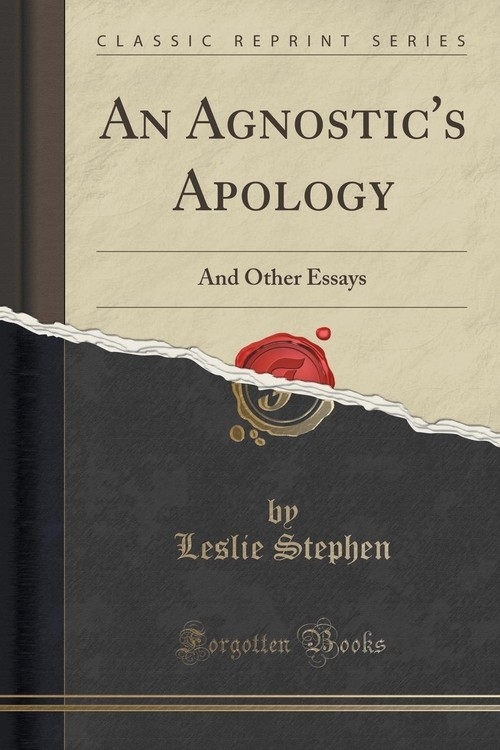 A gripping and emotional work around the power of religion and the defense of agnosticism, Leslie Stephen&apos;s <i>An Agnostic&apos;s Apology and Other Essays</i> is considered a seminal work in religious studies. Through the course of his life, Leslie Stephen held many professions including clergyman, journalist, author, and literary critic. In addition to his contributions to these fields, he is also known as the father of famous author Virginia Wolf and famous artist Vanessa Bell. Stephen was born and raised in London and many of his childhood experiences were shaped by religion. His immediate family was part of an early 19th century group of evangelical Christian social reformers known as the Clapham Sect, known for their religious mission and social activism. When Stephen went off to college, he continued his religious exploration through study and eventually became an Anglican clergyman. By his 30s, however, he renounced his religious beliefs and became an investigative journalist, both changes led to the writing and publication of his book <i>An Agnostic&apos;s Apology and Other Essays</i>.<br><br>Stephen begins the book by describing the difference between an atheist (one who does not believe in any god) and an agnostic (one who questions the existence of a god). "The Agnostic is one who asserts &apos;what no one denies&apos; that there are limits to the sphere of human intelligence..." This distinction is important for the reader to fully understand Stephen&apos;s points in his book. His work is colored with the same fervor and poignancy that filled his spiritual life and his argument for Agnosticism reads like a sermon.<br><br>Each of the essays in <i>An Agnostic&apos;s Apology and Other Essays</i> are about religion and religious themes. The Skepticism of Believers, Dreams and Realities; What is Materialism; Newman&apos;s Theory of Belief; Poisonous Opinions; and The Religion of all Sensible Men are all topics explored in the book. Stephen&apos;s own personal experiences help shade his approach to the topic of religion in an interesting and dynamic way. His own religious beliefs, or lack thereof, give an interesting look into religion during his lifetime. This book is an excellent read and highly recommended for any reader.<br><br>About the Publisher<br><br>Forgotten Books publishes hundreds of thousands of rare and classic books. Find more at www.forgottenbooks.com<br><br>This book is a reproduction of an important historical work. Forgotten Books uses state-of-the-art technology to digitally reconstruct the work, preserving the original format whilst repairing imperfections present in the aged copy. In rare cases, an imperfection in the original, such as a blemish or missing page, may be replicated in our edition. We do, however, repair the vast majority of imperfections successfully; any imperfections that remain are intentionally left to preserve the state of such historical works.